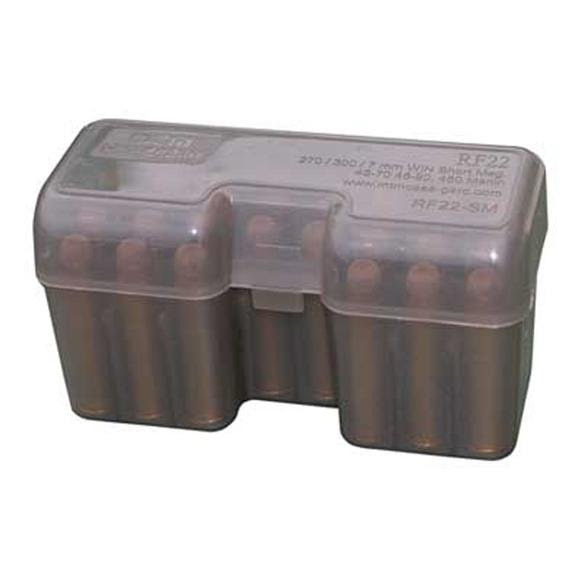 Your ammunition will stay safe and dry in these 22 round flip top ammo boxes made from polypropylene. They are designed for the new short magnums and the large ultra magnums and will not warp, crack, chip, peel, expand or contract. RF22-LM Cartridge Sizes 30 Super Flanged, 300 / 375 / 378 Wby.Mag., 300 / 338 / 375 / 7mm / Rem. Ultra Mag., 333 / 500 Jeffery, 338 Lapua Mag. Your ammunition will stay safe and dry in these 22 round flip top ammo boxes made from polypropylene. They are designed for the new short magnums and the large ultra magnums and will not warp, crack, chip, peel, expand or contract. 30 Super Flanged, 300 / 375 / 378 Wby.Mag., 300 / 338 / 375 / 7mm / Rem. Ultra Mag., 333 / 500 Jeffery, 338 Lapua Mag., 375 / 416 Dakota, 404 Jeffery, 40-65 Sharps Str., 416 Rem Mag., 416 Rigby, 450 / 400 Nitro Exp. 3", 7.21 Firebird, 7.62 Lazzeroni Warbird, 7.82 Lazzeroni Warbird, 10.57 Meteor.